The Human Settlements: The Urban-Rural Continuum. The other interesting standard that could be placed in to increase the efficiency of the human settlements lies in the present standards which divide the spaces as urban and rural areas. They are generally measured in terms of the demographic profile, density, area, no. of motorised vehicles, etc, which are in direct contrast if the standards of the quality of life are measured. 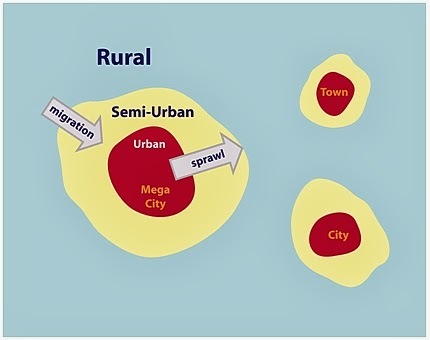 It will also become more and more important to conceive the cities not in terms of the well being of their average resident – which is generally superior to that of the average rural villager – but rather as places of astonishing diversity and inequality, in which substantial populations live in slum neighbourhoods facing threats to health that are as bad or worse than in rural environments’ (Urban Population-Development-Environment Dynamics in the Developing World, June 2002, Kenya). This will look a little unusual in the first perception, but when thought of as the life of the humanity and its basic living values, the readings and the set standards gives somewhat which can be said to as a translucent image. The cities aren’t the physical entities rather they are as lively as the organs of our body. The daily habits and schedule effects the functioning of the organs, likewise, the human interferences effects the functioning of the system, in which they live in. The complexity of the urban settlements has increased and is increasing at an accelerated pace every moment that passes by; therefore, it’s a real high time to raise the aspects covered in the contemporary planning processes to a wider level and all the factors involved should all be planned in integration with each other. The establishment of the concept of Urban-Rural Continuum in this respect should play a significant role in the future planning, developments, formation and growth of the human settlements. For the new developments and the new cities to be planned in the coming times, this concept if planned wisely should prove beneficial at large and the efficiency of the urban-rural ecosystem could be maintained at a higher level.